Today I was practically brain dead, exhausted from the hyperactivity of the past week, and stuck in a jam in Godmanchester on a grey day. Tantalisingly just a few minutes away from the HBN networking meeting I wished to attend, my thoughts returned to the last Friday. There, glorious sunshine had prompted me to get out of the car after the HBN meeting and wander around Godmanchester with my camera, somewhere I had previously just driven through for the past three years. 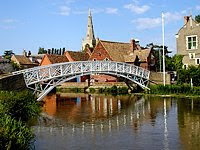 Chartered in 1212, Godmanchester turned out to be a little gem as I sauntered across the Chinese bridge, over the river Great Ouse. The boats, gardens and blue sky reflected peacefully on the water and pedestrians wandered unhurriedly past the timbered buildings. A friendly greeting to a local resident with a comment that I was enjoying looking around led to his suggestion that I make my way to the graveyard and look out for the grave of Mary Ann Weems to hear of her cautionary tale! 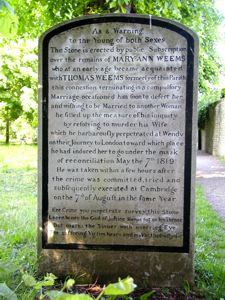 "As a Warning to the Young of both Sexes This Stone is erected by public Subscription over the remains of MARYANN WEEMS who at an early age became acquainted with THOMAS WEEMS formerly of this Parifh this connection terminating in a compulfory Marriage occafioned him foon to defect her and wifhing to be Married to another Woman he filled up the measure of his iniquity by refolving to murder his Wife which he barbaroufly perpetrated at Wendy on their journey to London toward which place he had induced her to go under the mask of reconciliation May the 7th 1819 He was taken within a few hours after the crime was committed,tried and subfequently executed at Cambridge on the 7th of Auguft in the fame Year Ere Crime you perpetrate survey this Stone Learn hence the God or Juftice sleeps not on his throne But works the Sinner with unerring Eye The suffering Victim hears and makes the Guilty die"
A sprightly octagenarian told me that she understood that Mary Ann was not as innocent as she seemed, having used a feigned pregnancy to snare her man! Another chance encounter in the White Hart pub back on the main road revealed that the body of the poor murdered MaryAnn had been laid out in that pub near the window so that the locals could pay their last respects. It was said that she still haunts the pub! The Godmanchester White Hart regulars also had another tale - of when a large truck screeched into the carpark and a horde of Americans piled out. Thinking there was going to be a fight, the locals rushed out to find that the real reason for the visit was much less confrontational. Whilst being stationed in the area a long time ago, an enterprising american had bought the old pub sign from his favorite watering hole and taken it back with him at the end of his tour of duty. Now, years later on a visit to the UK, he had returned to show his friends the pub where the sign had come from! Nice entry. 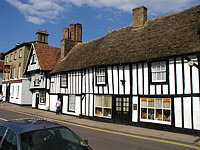 I've lived in Godmanchester for 33 years and worked at the White Hart for 6 years and never heard that story! Thanks. You didn't mention the other Chinese Bridge, the original one about 200 meters down the river from the one in your photo. Thanks Steve! If the bridge your are talking about is a wooden one, then I know which one you mean. In fact it was whilst trying to gain access to it that I ended up talking to the local resident who directed me to the gravestone. any other areas you would recommend for photography or unusual stories? The only way you'll get access to the old bridge is when the Van Percy's open Island Hall during the summer months. I think you can call and arrange a private visit. The only other story I can think off is the Nazi Scientists held at Farm Hall during the Second World Wat. Thanks Steve for the Van Percy's Summer opening tip! Fortunately it turned out that they were no where near even imagining the success of an atomic bomb before they were captured. Heisenberg is most frequently remembered by Physics students for his postulation of the uncertainty principle. This states that at a quantum level a particle's position and its momentum cannot be acurately determined at the same time.